Scotland is famous for its dynamic landscape, which serves as home to many different creatures. If you are interested in seeing wildlife, Scotland is the perfect place to visit! All sorts of different animals roam Scotland’s hills and fields, while various species of birds take flight through the skies, and sea-creatures dance through the waves! The American-Scottish Foundation has compiled a list of ten different Scottish creatures to spot in Scotland. Keep your eyes peeled for these wee beasties! 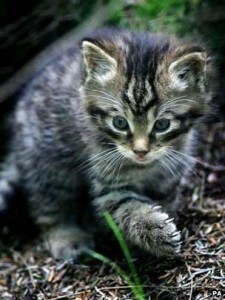 The Scottish Wildcat is the only wild, native forest cat in Britain. These cats are very elusive, hunting during the night and hiding among trees and rocky cairns. Although it is uncommon to see one of these majestic cats, they may be spotted in the Highlands and in the far North and West of Scotland. Scottish wildcats are now one of Britain’s rarest mammals, as their species is sadly endangered. Spotting one would truly be a magical experience. Pine Martens are difficult to spot, and are mostly found in the North of Britain. They tend to live in wooded areas, as they climb and live in trees. 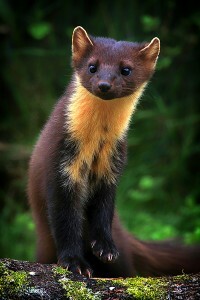 These brown and yellow critters are part of the weasel family. They are about the size of a cat, with a long, bushy tail and round ears. They are protected in the UK under the Wildlife and Countryside Act to preserve the species. They may be found throughout wooded areas in Scotland, including the Ballachuan Hazelwood and Balnaguard Glen Reserves. 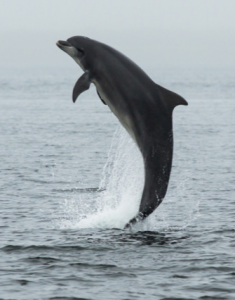 Out of all the Bottlenose Dolphins in the world, Scottish ones are the largest. There is a large resident group of these beautiful mammals in the North Sea, as well as smaller groups around the Hebrides. These sleek, grey animals are extremely intelligent, powerful creatures. The Moray Firth is one of the best places to look for them, particularly in the warmer summer months. Dolphin and Wildlife Watching boat trips are easy to find in Scotland, so don’t miss out! Scottish otters are often hard to spot, even though there is a thriving population. This is due to the animal’s shy nature. These semi-aquatic creatures live by water, as they mainly hunt for food in lochs, rivers, or the sea. The thick-furred mammals are able to survive in water by closing their ears and nose while they swim with their powerful webbed feet. Otters may be found along much of Scotland’s coast, particularly on the west coast, as well as the islands. 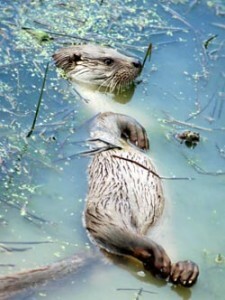 Although otters are elusive, if you keep a look out by the waterside, you may see more than one! 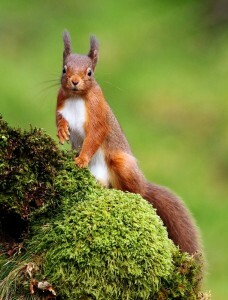 The red squirrel is the only species of squirrel native to the UK. Scotland is the home to about 80 percent of the UK’s population. As their name would suggest, these squirrels have bright, reddish coats of fur. They are smaller and sleeker than American grey squirrels, with large tufts of fur on their ears. 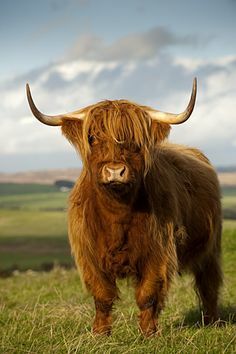 They may be spotted throughout Scotland’s wooded areas, but they are most likely to be seen in the Highlands and around the Caingorms. If you are determined to see these iconic Scottish critters, there is a Red Squirrel Walk through Dalbeattie Forest in Dumfries & Galloway. The magnificent golden eagle is a large bird of prey with a wingspan of over six feet. The majority of the UK’s golden eagle population lives in Scotland, as the birds prefer to live in areas with open, treeless land. 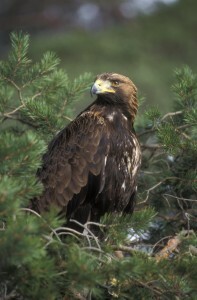 Golden eagles can be recognized by the golden plumage on their head, neck and shoulders. 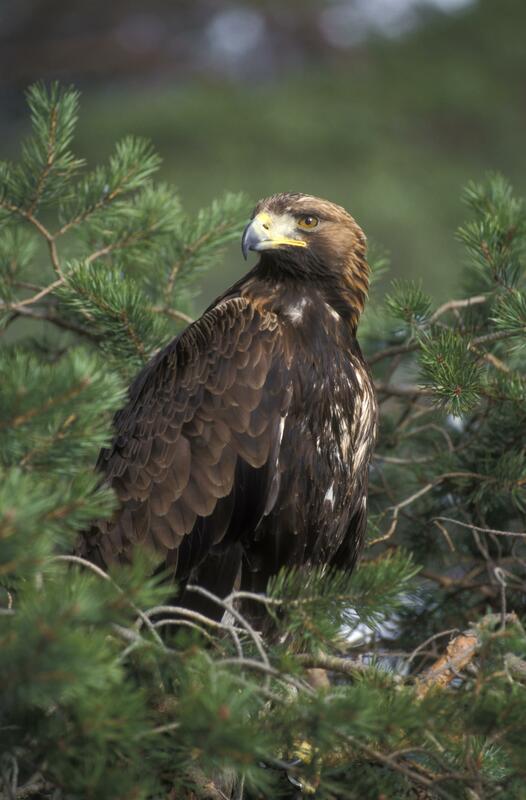 Scotland’s landscape is ideal for golden eagles to hunt, and you just might spot one searching for prey over moorland and peat bogs, or swooping over the open land around the Highlands and Northern Isles. Atlantic grey seals are one of the easiest animals to find in Scotland. You may spot groups of these seals in many places along Scotland’s coast. 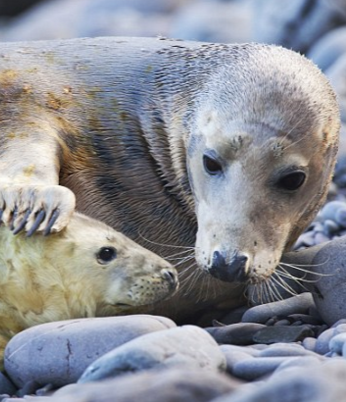 The biggest grey seal colonies are on remote islands such as the Orkney and Shetland Islands, the Hebrides, and the Monach Isles. The seals go to these islands to breed, but outside of breeding season you may see them lounging on beaches and rocks all along the sea. If you are visiting the Scottish seaside on your trip you are likely to spot a seal. And if you’re really lucky you may even see a fluffy seal pup! Shetland ponies might be small in size, but they are hugely famous! These charming ponies grow to be about 42 inches tall, and their soft coats come in many different colors. Their coats change by season- in the summer their coat is short and silky, while in the winter it grows twice as thick. These thick winter coats repel water and keep the ponies warm, even in the harsh island winters. 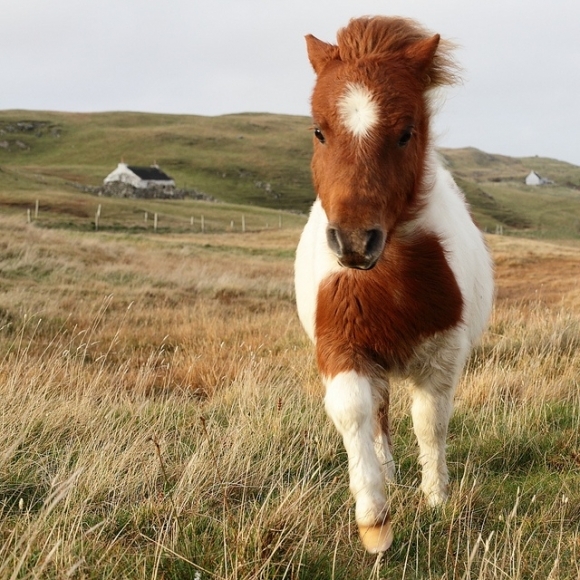 You can still see herds of these sturdy little ponies roaming the hills of Shetland, where they have lived for over 4000 years. Visit Shetland to meet some of these adorable creatures! Puffins, often referred to as “the clowns of the coast,” are instantly recognizable by their bright bills and signature waddle. Puffins live by the sea, usually in burrows on the top of cliffs. They hunt for fish in the water, diving from the cliffs and swimming beneath the waves. 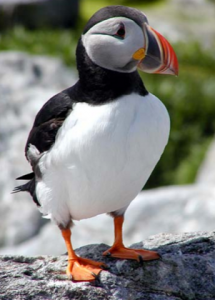 Puffin nests can be found on cliffs and islands around the coast of Scotland, as well as in England and Wales. The best places to see these funny little seabirds in Scotland are Handa Island, the Isle of Eigg, and the Longhaven Cliffs and the Seaton Cliffs reserves. 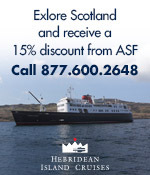 This entry was posted in Associate Events, Travel in Scotland, Uncategorized and tagged Atlantic Grey Seal, Ballachuan Hazelwood, Balnaguard Glen, Bottlenose dolphin, Caingorms, Dalbeattie Forest, Dumfries & Galloway, Golden Eagle, Handa Island, Highland Cow, Isle of Eigg, Longhaven Cliffs, Monach Isles, Moray Firth, Orkney, Otter, Pine Marten, Puffin, Red squirrel, Scottish Wildcat, Scottish Wildlife, Seaton Ciffs, Shetland, Shetland Pony, the Hebrides, the Highlands, Wildcat, Wildlife, Wildlife and Countryside Act on April 19, 2017 by Theresa Schilling.